It looks like that Digitimes rumor about Intel planning a tablet reference design was more than half true. Intel has just announced the StudyBook, a new 7" tablet that they plan to release to the academic market later this year. Intel's going to offer this design to regional OEMs, much like it does with the ClassMate PC, an educational laptop design that Intel first introduced in 2008. That device is available from at least 3 vendors that I know of (US, Russia, South America), so it would seem likely that the StudyBook might be as widely distributed. The StudyBook itself is going to run either Windows or Android 3.0 Honeycomb on Intel's own 1.2GHz Atom Z650 CPU. Intel is predicting that it will cost around $200 when it ships. The tablet has already gotten into then hands of some of the gadget blogs, and it looks like I was right when I predicted that Playskool assisted in the design. The Studybook has a thick white case with a black from and grey hand grips on the short sides. The length, width, and thickness are all noticeably higher than on your average 7" tablet, which adds to the impression that it's bulky and chunky. On the plus side, it is boasted as being spill and drop resistant. Depending on what the OEMs do it it, this tablet could be offered with anywhere from 4GB to 32 GB Flash storage, cameras, 3G, Bluetooth, or a whole host of other options. I'm betting that the $200 price that I mentioned above won't include most of those features; that base model will likely also run Android. 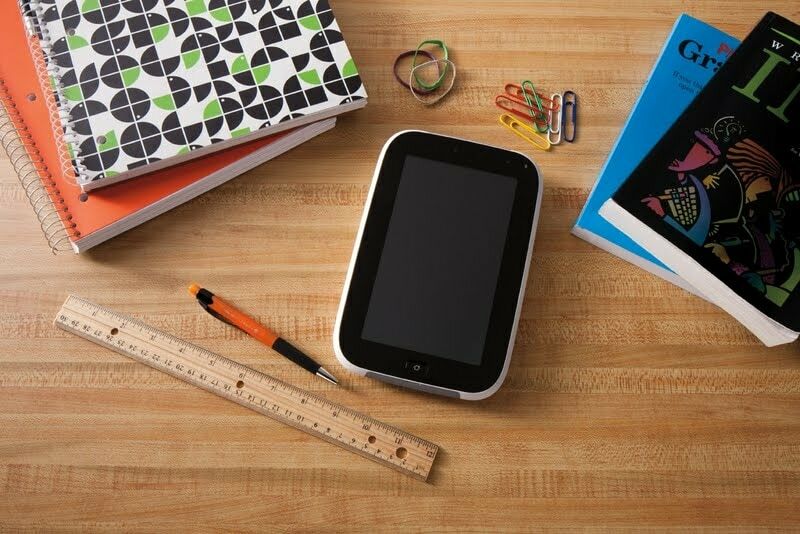 Intel wants this tablet to survive school kids, which would explain the think and rugged design. But I'm not completely sure that was necessary. The thing is, I know several people who have done 1:1 programs with tablets. No on ever reported that the standard consumer models weren't sturdy enough for classroom use. Sure, they all bought cases to protect the tablets, but whoever buys the Studybook will probably also buy a case. I'm also not sure how good of a value the low end Studybook will be. By the time it hits the market you'll be able to get an Android tablet twice as good for the same price. What's more, that other tablet will probably be able to best the Studybook in battery life as well as performance. 8.1? x 5.3? x 0.65? SANTA CLARA, Calif., April 10, 2012 – Intel Corporation today introduced an Intel® studybook, a tablet that is part of the Intel Learning Series family and features unique classroom-ready features and capabilities including an ultra rugged design and specialized educational software. Purpose-built for 1:1 e-learning, a studybook's innovative features include front and rear cameras, microphone, light sensor support project-based inquiry and mobile learning environments. It comes with a capacitive multi-touch LCD screen and is based on an Intel® Atom™ processor Z650. The rugged tablet reference design is constructed from a single piece of plastic and includes shock-absorbers around the screen. It is designed to withstand accidental drops from a standard student desk and is also water- and dust- resistant. Young students, often owners of slippery fingers can learn and have fun in and out of the classroom with reduced stress for parents and teachers concerned about damage. An Intel studybook provides education-focused solutions with a student-friendly design. The education software includes classroom management, LabCam applications that support scientific enquiry, and an optimized ereader. The collaboration software has a user-friendly interface which enables teachers and students to collaborate in the classroom for improved learning efficiency. "An Intel studybook offers students limitless opportunities to enhance their learning experience." said Kapil Wadhera, general manager of Intel's Education Market Platform Group. "Expanding the Intel Learning Series portfolio of affordable, purpose-built educational devices brings us closer to our vision of enabling more students and teachers to participate in high quality education." Teachers are an integral part of the classroom and the new Intel Learning Series Teacher PC criteria will enable solutions that are developed specifically to meet the needs of teachers. The criteria are available to computer manufactures to build purpose built education notebooks and Ultrabooks™ for teachers and will take advantage of the 500 member strong Intel Learning Series ecosystem. Teacher PCs also come with access to education content, professional development and digital literacy resources. As a component of the Intel Learning Series family of products, an Intel studybook is grounded in ethnographic studies. The hardware and software elements of an Intel studybook have been piloted in more than 2,000 classrooms in 36 countries. Its infrastructure is tailored to individual geographies in terms of content, cultural relevance, and language. Intel® Learning Series brings together digital content, teacher training, deployment support and purpose-built education technology to enable successful 1:1 e-learning environments for students. Through a strong ecosystem of PC manufacturers, operating system vendors, education service providers, content and software providers, the Learning Series delivers complete end-to-end education solutions. More than 500 alliance members in 70 countries are developing applications, peripherals and services optimized for the Learning Series. More information available at www.intellearningseries.com.